Continuing my Star Wars Resume! 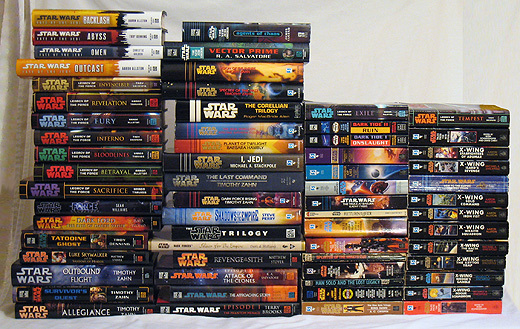 Today I’m featuring my Star Wars novel collection. I’m excited as I’m about to start the Fate of the Jedi novels (top left hand corner in the photo below). The rest of these I’ve already read. My love for Star Wars novels started in 1991 with Timothy Zahn’s Heir to the Empire. My good buddy Ravenface sold me on the book when he explained that Wookies have claws. That simple insight made me want to learn more about the Star Wars universe. I’ve been reading ever since. While there are very few New Jedi Order books below, I did get through those novels on audiobook. Click the image below to enlarge. Like many readers of the novels, my favorite Expanded Universe (EU) characters are: Mara Jade Skywalker, Grand Admiral Thrawn, and Corran Horn. While reading the Legacy of the Force novels, I’ve really started to like Jaina Solo and Ben Skywalker. Both characters were great in these novels and they proved themselves worthy of their parent’s legacy. My favorite Star Wars writers are Michael Stackpole and Timothy Zahn. They were the pioneers of the EU and helped forge the New Republic, a fascinating era for our heroes continued adventures. I had the chance to meet both authors at Dragon*Con a few years ago. What super cool guys! You’ll notice there are very few prequel era novels above. That time period just doesn’t hold much interest for me. However, I’m considering trying the Republic Commando novels based upon a review I heard on the Two True Freaks Monthly Monday Star Wars podcasts. They did a good job explained why the Order 66 novel was a solid and and compelling read. Might be worth checking out. You know, I have never read a Star Wars novel. Read plenty of Star Trek ones but never a Star Wars one. Is that weird? I have a local used book store with a huge selection of Star Wars novels. Any you would recommend to start with? Luke – Thanks for the comment. Two ways to look at it… If you want to follow the adventures of the main characters (Luke, Han, Leia, etc), then start with “Heir to the Empire” by Timothy Zahn. If you want to follow the adventures of minor characters (like Wedge) and new characters (like Corran Horn), then start with “X-Wing: Rouge Squadron” by Michael A. Stackpole. You should be able to find either in bookstores or your local library. Let me know if you try them out! Thanks again for commenting! It’s probably best that I don’t know your home address, because some of your stuff might turn up “missing.” I’m just saying. Great collection. I just have a question. Why there is in the picture, hardcovers with different sizes? I thought were all the same. I cannot believe you typed that whole list of novels! E – LOL! You’re welcome to borrow anything anytime. Stuart – That’s the beauty of Wikipedia’s entry on “List of Star Wars Novels”. Cut and paste my friend, then edit. That’s my motto. Harold – Good catch. I’m a member of the Science Fiction book club (SFBC). Nearly all their books are in hardback format (even if the mass market edition is paperback), and slightly smaller than a typical hardcover. The size is what differentiates them from regular mass market editions. I don’t mind the slightly smaller size given the savings I get through SFBC (even if they resell value of SFBC versions is practically zero). Does “Heir to the Empire” pick up after Jedi? Luke – Yup. “Heir to the Empire” picks up about 5 years after “Return of the Jedi”. “Heir to the Empire” really kicked off the Expanded Universe in novels. The “X-Wing” books were published afterward, but actually take place prior to “Heir to the Empire”. However, I’d still recommend “Heir to the Empire” is the best place to start. Just keep in mind it was written prior to the Prequels, so there are no mentions of Prequel items. @Shag: I picked up Heir To The Empire today at Mr. K’s/. They also had several copies of Dark Force Rising, but oddly, no copies of The Last Command. I’ll have to keep an eye out for it I guess. Also picked up an Iron Man novel but that’s for another post I think! I read about 10 of these novels back in the day, and i thought the ones by Timothy Zahn stood out far above the rest… the rest were not nearly as good and some were downright bad – the one where Luke is in love with some woman and she ends up trapped inside a computer? and then the computer gets blown up or something…? lame. Why not start with Lost Tribe of the Sith? if we are talking about Expanded Universe.